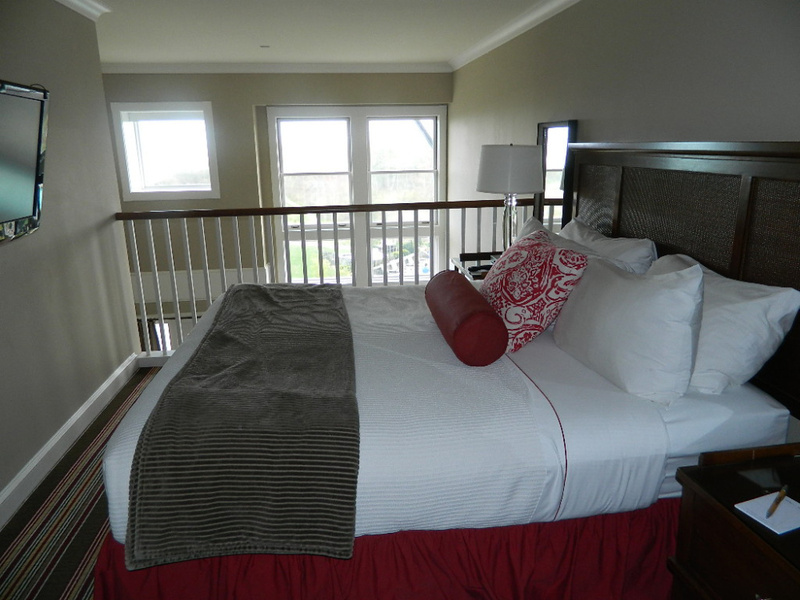 Entering the two-story suite at Inn By the Sea in Cape Elizabeth, I breathe a sigh of relaxation. The inn’s contemporary design is a stark contrast to our old cape in Mount Vernon. And it is one of the most beautiful places we have ever stayed. Check out their website for infomation on upcoming wine dinners and more. Their spacious rooms are tastefully decorated, but not overdone.Our room is a space filled with clean lines and artwork. There is even a small kitchen with island seating, as well as a microwave, fridge, coffee pot, and full set of dishes and silverware. The wall facing the sea includes a two-story window with an automatic shade. Double doors open to a private deck. Sea smoke was rising off the ocean on this December morning while lobster boats were already out. It is so luxurious here that slept in until 7:30 a.m. — pretty rare for me. It might have something to do with that ultra-comfortable bed. 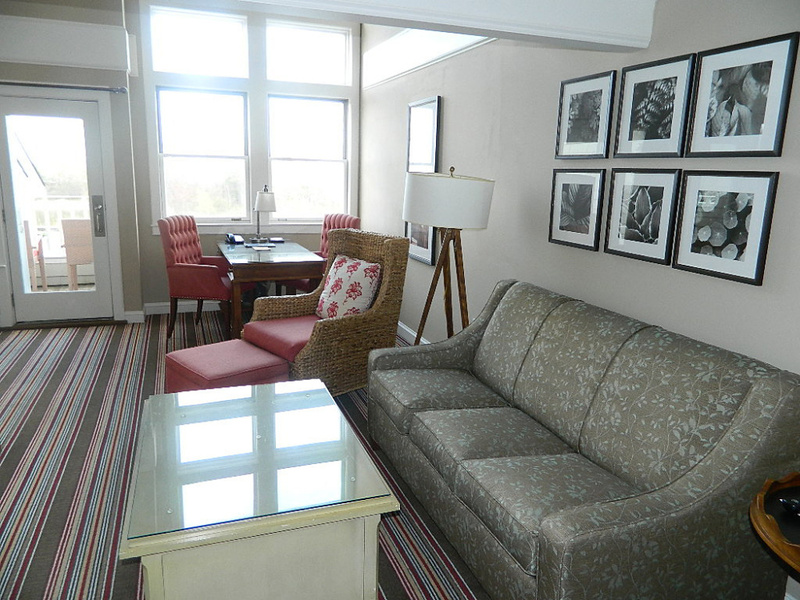 This suite also has my heart due to the two-room bathroom — a suite in itself. An enormous glassed-in shower, Jacuzzi bathtub and double sinks with lovely bath products are available for pampering yourself. Surely you have a special occasion sometime in the next year where you’d like to be pampered — this is the place to be. It’s no surprise to us that Inn by the Sea was cited by Travel & Leisure as one of the 100 best hotels in the world last year. That’s right, best in the world! Check out the inn’s website and you’ll see many of the other awards it has won. 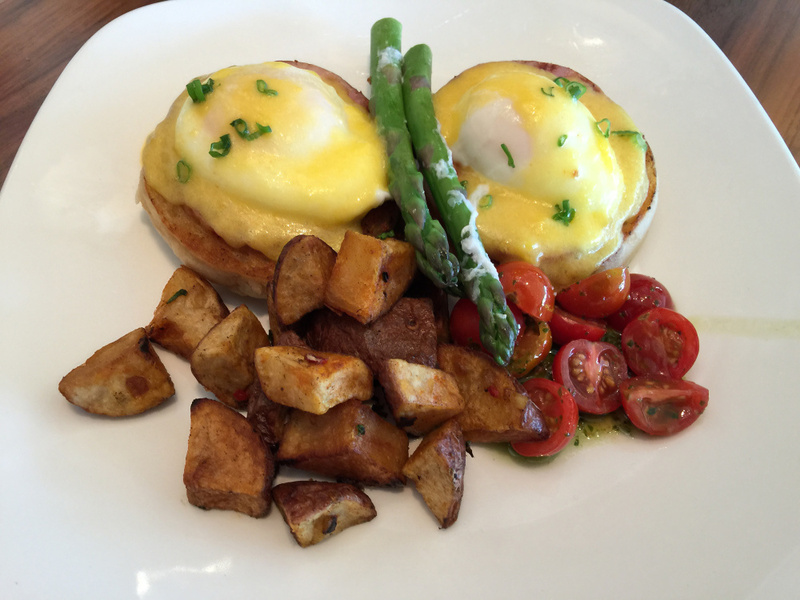 Last week, we told you about the inn’s wonderful restaurant, but that’s only part of the story. The suites are elegant. Room 204 has become “our” room. The two-story window with a view out over the ocean is spectacular. The living room has comfortable chairs and a couch, and I’ve typed up columns sitting at their expansive desk as I gazed out the window at the bobbing boats anchored just offshore. In the upstairs closet, you’ll find wonderful robes that you can wear down to the spa. (We actually saw three ladies enjoying cocktails in the bar while wearing their robes!) At the spa, you’ll get a private locker and the opportunity to enjoy the Jacuzzi, steam room, “experience” showers, massages and other special treatments, lush amenities and even beverages “to help you transition into a relaxed frame of mind.” Nice. Yes, you are pampered here. And so are your pets. The inn offers a special section where pets are welcomed — and the pets even have their own menu. But let’s back up a minute. Upon entering, we were greeted like long-lost friends by Eva at the front desk. Then Rauni Kew, the inn’s marketing director, stopped by. Over the six years we’ve been writing this column, Rauni has become a good friend, so there was lots more visiting before we eventually got up to our room to relax for a while before our amazing dinner. From the nightly outside fires to the garden tours to the uncrowded beach to the swimming pool — well, this is a great place in the warmer months. But we actually prefer the winter when the inn and restaurant are less crowded and the staff has more time to visit with us. And here’s more good news: They are building two-bedroom cottage-style suites that will open in June. While there is a lot to admire and enjoy at the Inn by the Sea, I most appreciate the the inn’s commitment to wildlife conservation and the environment. It’s a leader in energy and water conservation, including the use of recycled materials in the new building. The inn also contributes to many local charities and sponsors a project that features dogs available for adoption. The inn has one of the dogs on the premises at all times and has so far found homes for 72 dogs. The “Rabbitat” restoration is my favorite project here, a partnership with the Department of Conservation and Bureau of Parks and Lands to restore habitat for endangered cottontail rabbits at Crescent Beach State Park. The inn removed two acres of invasive non-indigenous plant species such as bamboo and bittersweet from state property and replanted the area with indigenous shrubs to create a high-quality, safe habitat for cottontails. The inn also is active in the effort to restore monarch butterflies, earning a Wildlife Habitat certification from the National Wildlife Federation. Their talented gardener Derrick Daley uses local plants to create ever-blooming gardens, and teaches visitors how to “plant for wildlife” during his garden tours. Children create bug costumes at “Bug’s Life” and learn about local ecosystems from a bug’s viewpoint. We lingered long in our room before heading downstairs for breakfast. Our server, Lexi, was very attentive, and Rauni joined us again for a nice visit. 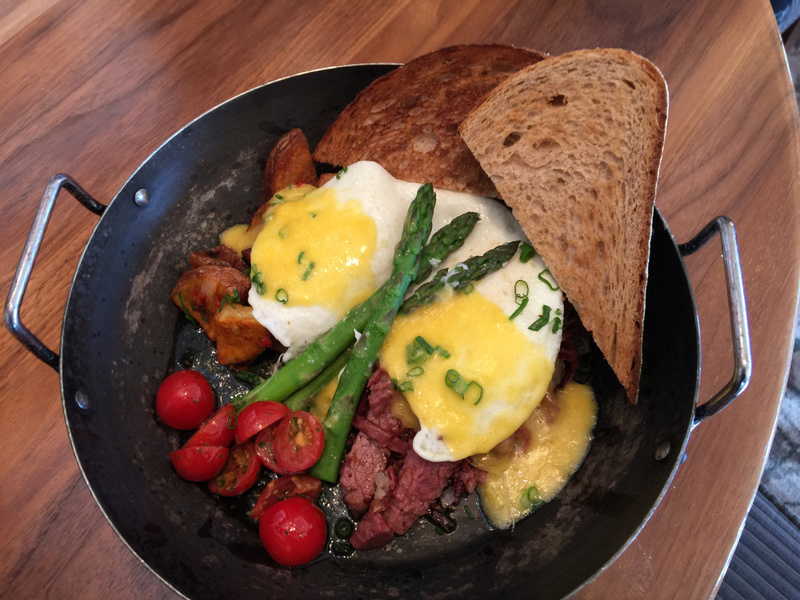 I’m in a breakfast rut here, always ordering the Farm House ($16): two eggs, corned beef hash, asparagus and hollandaise sauce, with fresh fruit and an apple parfait. Delicious. Portions are huge and neither Linda nor I could finish our breakfasts. In fact, when we got home, we skipped lunch. 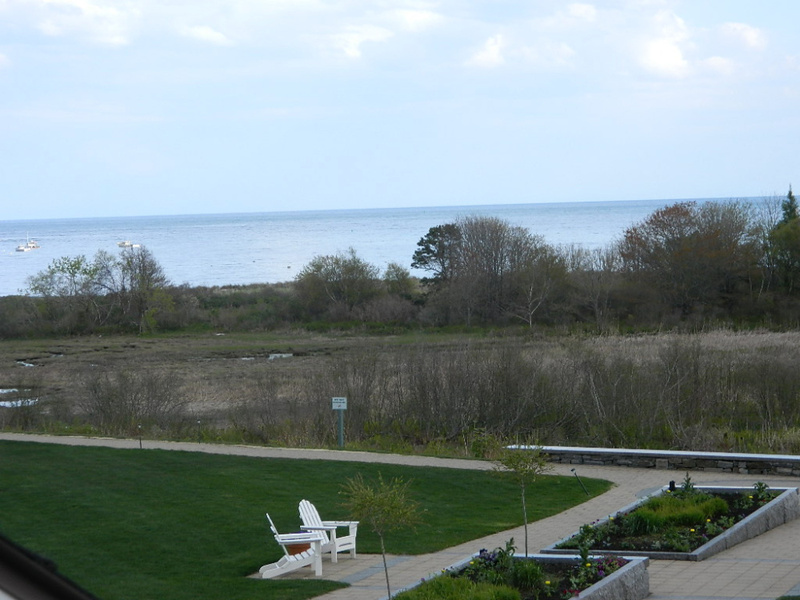 You won’t want to skip the opportunity to stay at the Inn by the Sea and enjoy their great Sea Glass Restaurant. It’s a world class experience.